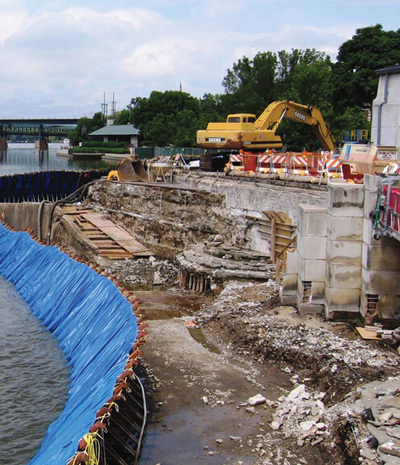 The Fox River Corridor Master Plan includes dozens of important recommendations to “Create a lively riverfront environment that is the centerpiece of the community”. Fortunately, as detailed in the Opportunity Analysis, St. Charles has the critical natural, cultural and physical resources that enable community leaders to execute the strategy with confidence. However, the size of the study area, the number of improvement recommendations, and the multi-jurisdictional influences make rapid implementation a daunting task. In this section, the recommendations are translated into specific, prioritized projects and actions that are organized as Public Policy Improvements, Operational Improvements, and Capital Improvements. Each project describes the type, potential cost, potential funding source, and the leaders and partners who are responsible for completing the project. Projects are prioritized based on their level of complication, potential cost, their catalytic potential and expected return on investment. Both public and private sector leaders and property owners will be responsible for executing the actions outlined in this plan, often in close collaboration with each other. With the periodic assistance of legal, marketing and other business consultants, the Active River Task Force (ARTF) can accomplish many modest cost initiatives such as policy and operational changes, if members are willing to invest the time to work through the issues. By comparison, many of the larger capital improvements will require the assistance of design and engineering consultants and involve considerable City, Park District, and/or Forest Preserve leadership and investment because of their scale, complexity and cost. Since the construction of some of the new capital improvements will depend, in part, on outside grant funding, completion may extend beyond the outlined time horizon. Lastly, private redevelopment is heavily influenced by the market, investor and property owner circumstances that are difficult to forecast. Logically, redevelopment will likely follow and be influenced by the public policy and operational improvements. Park District, City, and Forest Preserve District leaders, property and business owners, and other stakeholders need to closely collaborate to update and refine certain policies that will help advance the strategy. The ARTF, made up of representatives from each of these groups, should continue to remain active to advance the priority policy improvements. The Park District, City, and Forest Preserve District are responsible for many day-to-day operational activities such as code enforcement, public property maintenance and programming, along with community outreach and advocacy. Additionally, private property and business owners are responsible for leasing, managing and maintaining their properties. Ideally, all public and private sector stakeholders will work closely together to improve the river corridor. Focusing on areas of common interest and defining how each entity can participate mitigates any potential overlap or competing interests in the work necessary to improve the river corridor. Once again, the ARTF can continue to play an important role in advancing the priority operational improvements. This plan identifies many capital improvements, some of which can be completed in a relatively short timeline. Others, because of cost and complexity, will take many years to implement. Park District, City and Forest Preserve District leaders should start with simple, high impact, modest cost projects, then budget for and initiate more complicated, high-investment/high impact projects, as funding allows, giving the highest priority to the most catalytic projects. Leaders should also link the master-planned capital improvements to significant private sector investment, whenever possible to leverage the impacts. Capital improvement projects typically follow a three phase process: Preliminary Design and Engineering (Phase I), Final Design and Engineering (Phase II), and Construction (Phase III). Customarily, the cost of Phase I and Phase II services is 10 percent of the project value, and the cost of Phase III is typically 3-5 percent of the total project value. With more complex projects, leaders should initiate Phase I consulting services well in advance of the targeted construction date to accommodate sometimes lengthy outreach, design, engineering and multijurisdictional permitting timelines. Community leaders should use this prioritized list of actions and improvements to guide policy, capital and operational improvements over the next 3 years. They should update this list, annually, to review progress, re-order actions based on changed circumstances, and identify new actions related to emerging opportunities. Costs are uninflated 2015 dollars, and leadership roles are noted with the understanding that elected leaders in the partnering agencies must approve all policies and appropriations.